Players and staff from Leicester City were set to arrive in Bangkok Sunday to attend a mourning rite for the clubâ€™s chairman Vichai Srivaddhanaprabha, whose death last week in a helicopter crash stunned the Premier League club. Sunday marks the second day of a week-long ceremony held at Wat Thepsirin, one of Bangkokâ€™s most famous temples which typically serves as the site for funerals of very important Thais. Over the coming days Thailandâ€™s business and political elites are expected to visit the temple to pay their respects, while monks will chant Buddhist verses over the duty-free mogulâ€™s body. Vichai, 60, died last week, along with four others, when his helicopter crashed and burst into flames moments after taking off from Leicesterâ€™s pitch following a match. His death sent shockwaves through Leicester, where the charismatic Vichai had become a beloved figure in the club and the city â€” a feat rarely achieved by the Premier Leagueâ€™s foreign owners. Massive banners featuring Thailandâ€™s flag saying â€œR.I.P. Vichaiâ€ moved across the stadium, and the crowd observed a minute of silence. 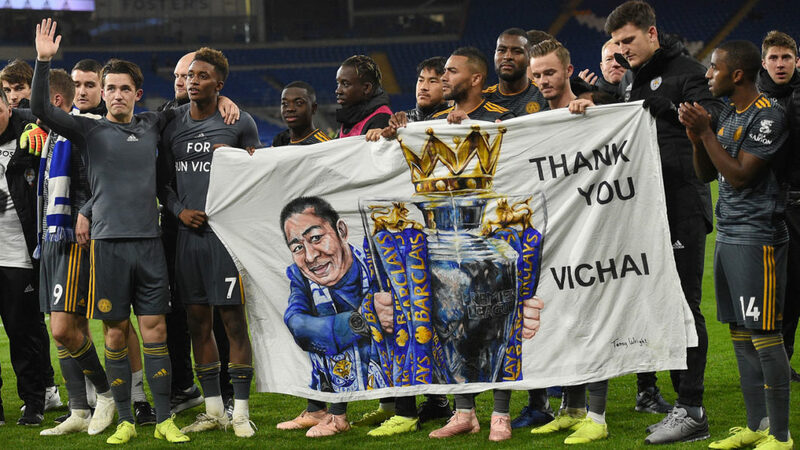 Fans wore T-shirts with Vichaiâ€™s picture on it, underneath the words â€œThe Bossâ€. After the match, 13 members of Leicester City including manager Claude Puel, striker Jamie Vardy and Shinji Okazaki â€” boarded a chartered flight to Bangkok, according to a statement from Vichaiâ€™s company, King Power. Goalkeeper Kasper Schmeichel who is believed to be the closest of all the Leicester players to Vichai â€” will also attend the funeral. A King Power spokesman also added that Princess Sirivannavari Nariratana, the daughter of King Maha Vajiralongkorn, is expected to attend Sundayâ€™s ceremony. After the week-long ceremony, Vichaiâ€™s body will be kept for 100 days before cremation, though a date has yet to be set. Vichaiâ€™s company started out with a single store in Bangkok; today, his King Power empire includes a monopoly over the duty-free shops in Thailandâ€™s tourist-heavy airports. Despite his business smarts Vichai owed his ascent to the canny navigation of Thailandâ€™s unpredictable politics and powerbrokers. His links to the monarchy were reflected in the name of his company and his surname â€” which was bestowed upon him by the former king, and means â€œauspicious and prosperous lightâ€. The four other crash victims were identified by British police as Nursara Suknamai â€” an actress and a runner-up in Miss Thailand Universe in 2005 â€” and Kaveporn Punpare, both members of Vichaiâ€™s staff, pilot Eric Swaffer and passenger Izabela Roza Lechowicz.